Greetings from the Ride Down South crew, we’re looking forward to having you join us on our July adventure through South Africa, Namibia and Botswana. Since we put the word out about our first trip as a tour company we’ve had 5 riders and a support car passenger sign up. We’re also bringing along three of our crew, 2 of us on our own bikes and a driver, which means we’ll be a party of 9. It’s a much bigger group than we first anticipated but we’re excited to show everyone this part of the world – and do some exploring together too. We’ve been hard at work getting the finer details of the trip sorted out and have put together this detailed itinerary that also includes some important information about the trip. Please get in touch if anything is unclear or if you have any further queries. Check the optional accessories – SENA Bluetooth headset, Garmin GPS and Go-Pro video cameras – and let us know if you’d like us to reserve any for you. Please note that the balance of the trip cost is due by the 26th June, two weeks before the trip starts. Note also that we require a motorcycle damage deposit of R8000 that will be refunded at the end of the trip less the amount required to repair any damage to the bike caused by you. The easiest way to handle this is by cash payment in your local currency when you arrive in Cape Town. Please ensure that you have booked your own accommodation for the nights of 8 and 9 July. Our trip base is located near the southern Suburbs of Cape Town. Suggested areas to search include Claremont, Kenilworth, Rondebosch or Newlands. We will arrange to pick you up at the airport. Please send us your flight details so we can track the progress of your flight. Cape Town international airport has places to change money and buy local phone sim cards if needed. We have booked accommodation in lodges and campsites along the route. Lodge accommodation is typically in twin sharing rooms. The campsites all have electricity and hot water. We’ve listed the type of accommodation and a link for you to explore the venue in the detailed itinerary below. We will provide for all breakfasts and some dinners to the value of R150 per person per day. The remaining dinners are provided by restaurants at our overnight stops and will be for your account, as are all drinks. If you’d prefer to save on those meal costs by making your own arrangements you’ll be welcome to do that. Details of the meal plan are indicated for each day in the itinerary below. The timing, location and cost of lunches will vary depending on the plan for each day. We estimate lunches will cost on average R50 per person per day. Our trip takes place in the middle of the Southern Hemisphere winter. 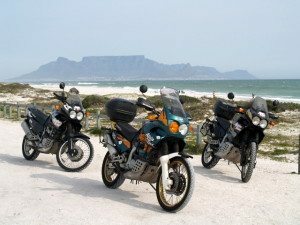 Apart from the possibility of rain in Cape Town and on the first day of riding we should enjoy dry, sunny weather for the rest of the trip. Temperatures may be quite cool while we are in the southern parts of the route – particularly between Cape Town and Windhoek. Overnight temperatures may drop below 0 degrees Celsius and we’ve encountered morning temperatures between 7-10 C on previous trips. Temperatures north of Windhoek are warmer – typically between 15 and 30 C. Please bring suitable clothes, sleeping bags and riding gear. Camping gear: Please bring your own sleeping bag and flashlight for the nights we will be camping. All other camping equipment – your own tent, inflatable mattress and ground sheet – will be provided. we can provide a mounted GPS and an in-helmet communication system as optional extras, see details below. The support car and trailer will have limited space for additional luggage. If possible please use soft/collapsible bags for your luggage that could be either strapped to the bike or stored compactly in the car. We have expanded our fleet of motorcycles to accommodate the interest we’ve received for our trips this year. We currently have 4 Honda Africa Twin 750cc bikes and 2 Suzuki V-Strom 650cc bikes. These will all be in use on our July trip. The Suzukis are highly capable bikes and are particularly suitable for shorter riders. If you have a preference for a particular bike please let us know. All our prices are listed in South African Rands (R). Please check the current exchange rate as the Rand is quite volatile at the moment (www.xe.com or use the widget in the sidebar of this page). Fuel: Current fuel prices are R12.74, R10.38, and R14.60 per liter in South Africa, Namibia and Botswana respectively. You can expect the bikes to achieve between 17-20 km/liter depending on speed, wind and luggage carried. This works out, very roughly, to about R2900 in total fuel costs. Passports: please ensure your passports are valid for at least 6 months after your arrival into each of the countries we will be visiting. Our last border entry is on the 20th July so the expiration date should be no earlier than 20 January 2017. The northern part of our route takes us for a few days through the southern edges of an area where malaria is known to be a risk – see this map http://www.who.int/malaria/travellers/en. We recommend you get advice on the correct prophylaxis to counter this risk. Mosquito repellant is also highly recommended. While we are not aware of any other diseases along our route requiring immunisation we recommend you check with a travel clinic for the latest updates. There will be at least one level-one first aider on the trip and we will be carrying a full first aid kit with us. In addition we have our own access to emergency medical rescue services at all points on the trip. Please ensure that your travel insurance covers you for riding motorcycles. The majority of the journey will be made on tar roads but some will be on gravel roads. Note: we’ve made a few changes from the itinerary on the website. We’ve shifted the rest day at the Orange River to allow us to spend two nights at Namibrand. We’ve also arranged two-night stays at Dqae Qare San Lodge, Drotsky’s Cabins and Erindi. We think this will allow us to experience these locations in a more relaxed way and get the most out of our time there. Arrive in Cape Town. We’ll pick you up from the airport and take you to your accommodation. If the weather is good and the group has enough energy we’ll go for a short introductory ride to check out the city. Activities: Flexible, depending on your time of arrival and energy levels. A rest and recovery day for those who’ve flown in from far away before we set out on the ride north. We’ll have the whole day to explore the area around Cape Town. Possibilities include touring the winelands, visiting Cape Point Nature Reserve, exploring Table Mountain, or relaxing at the V&A Waterfront. This is also the day to get any kit you need for the trip. The ride begins! We have a variety of route options as we head north. These include a west coast route through the West Coast National Park; or more directly along the N7 with optional detours through the Cederberg mountain range. Two spectacular mountain passes take us up the escarpment to higher ground before we stop for the night at Nieuwoudville. Food: 2-course dinner provided by hosts – included. We continue north along South Africa’s west coast and into the dry but starkly beautiful Richtersveld. After crossing the border into Namibia we stay overnight on the banks of the Orange River at the peaceful Provenance camp that overlooks the river and has an excellent restaurant. Today we leave the tarmac and explore Namibia’s good gravel roads, stopping in at Ai Ais hot springs for lunch before getting a chance to see the Fish River Canyon where we stop overnight. Breakfast provided by lodge, included. An early start today to cover the ground needed to get to our overnight stop at the quiet Namibrand Family Hideout where we’ll get to enjoy the vast expanse of Namibia’s desert region and observe the southern night sky. Leaving the bikes to rest for a day we spend today exploring the wilderness area in the nature reserve. Breakfast provided by us, included. 3 hour guided dune drive over the dunes (vegetated with mainly camel thorn trees and various grass species), the route takes us over the dunes, through rockier and more mountainous terrain and into the western gravel plains of Namibrand. We have a choice of routes through to Windhoek but either way we’ll aim to pass through the canyon at Sesriem and the dunes at Sossusvlei. We end today at Windhoek where we’ll say goodbye to some of our first leg crew and hello to the second leg crew. Dinner at local restaurant, not included. Menu prices R80 – R288. From Windhoek we head east, crossing into Botswana where we end up at the Dqae Qare San Lodge, home of San people for over 15000 years. We spend two nights here soaking in this unique experience. Breakfast, provided by lodge, included. Today you’ll have a range of options to experience life in this San community. These include learning the ancient art of fire making by hand, and the art of gathering food and medicinal plants on a bush walk. In the evening observe the Milky Way, Saturn and its rings and more through a ten-inch telescope with local amateur astronomer Greg. Our journey through the Central Kalahari continues as we head north-east towards the Okavango panhandle. You may have to avoid a flock of ostriches as we head toward the Okavango River and our accommodation for the next two nights at Drotsky’s Cabins. Breakfast, provided by us, included. We let the bikes rest for a bit today as we get a chance to explore the Okavango River and surrounds. A wide range of activities that take in the local wildlife and history is available – see info below. En route to Etosha, we cross back into Namibia and turn west into the famous Caprivi Strip where we ride along the Zambezi River to our overnight stop at Rundu. Today we head south-west to Etosha National Park stopping for lunch at Grootfontein where we could view the Hoba meteorite – at 66 tons the largest meteorite ever found, or we could visit the Dragon’s Breath Cave, the largest non-subglacial underground lake in the world. Etosha is one of our favourite game parks and offers excellent game viewing. The many waterholes attract endangered black rhinoceros, lion, elephant and large numbers of antelope. And of course the birdlife is excellent. We’ve booked a flexible full day game drive to take in the most of this amazing location. Breakfast, provided by Etosha Lodge, included. Dinner, barbeque under the stars, included. We leave Etosha heading south towards Erindi Private Game Reserve. We route via the famous Vingerklip rock formation where we’ll stop for lunch. 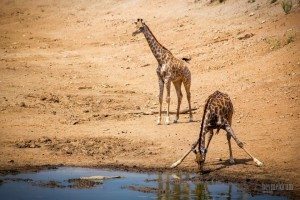 At Erindi there’s a number of options including a guided bush walk and game drives, or just relax in one of the chalets or the campsite, both of which overlook a floodlit waterhole. Dinner, provided by us, included. Guests flying out of Windhoek early on the 25th can travel through to Windhoek in the support car in the evening. Activities: see above, not included. We make our way south to Windhoek where we’ll unpack and celebrate the end of a great trip together. We’ll provide transfers to Windhoek International Airport for those flying out on the 25th or the following day.